With hundreds of machines sold Australia wide the Senator brand has instilled it's name in the Australian market as an exceptional and highly durable entry level Screw compressor. Designed and specified in Australia and hand assembled off the production line in a purpose built facility in China makes its pricing very competitive. The range compromises of tank mounted 5-15 kw units, 18-75 kw base mounted units and coming soon tank mounted 4 in 1 machines up to 15kw available in both fixed speed and variable speed. 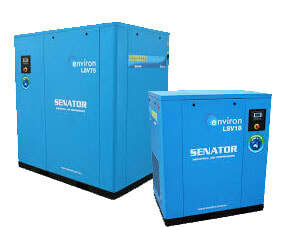 There is definitely a Senator Screw compressor available to meet your requirements and budget. Mounted on AS1210 wet/dry tanks these are some of the quietest compressors on the market. You'll be surprised by the exceptional value these units offer.